I think nearly everything is better if it has just a bit of crocheted lace embellishing it. I always have at least one lace project in progress. Of course, that means that my blocking boards and wires are almost constantly in use. Blocking makes all lace more beautiful. Freshly made lace is rumpled, springy, and stretchy. It's lovely, but is not even near its full potential. To achieve airy, drapey, elegant lace, we need to block it. 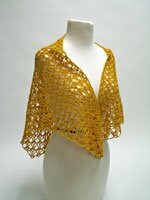 This is my pre-blocked Moss Fern Wrap, designed by Kimberly K. McAlindin (Interweave Crochet Fall 2009). 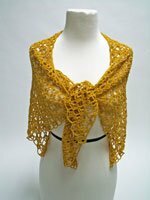 It is a great shawl for lace beginners: it works up quickly with a simple, easy-to-remember stitch repeat. My shawl was made with a wool/soy/cotton/chitin blend sock yarn (South West Trading Company's Tofutsie; one ball). 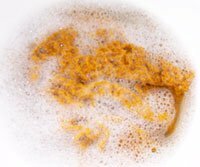 Once it was finished, I soaked it for ten minutes in a bowl of warm water with a bit of wool wash in it. Note that some fibers like wool wash and others don't. Some like warm water, and others prefer cold. Check your ball band and have a nice chat with your yarn before this step. After the shawl had a nice soak, I stretched it out on a foam mat and threaded blocking wires through each edge of the shawl, weaving the wire through the lace openings. Then I gently stretched the wires away from each other, stretching and opening the stitches of my lace. 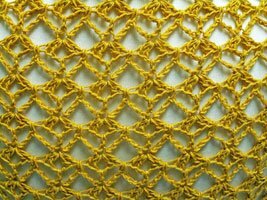 When it was stretched out to the point where the lace looked nice and open, and the measurements of the shawl were to my liking, I pinned down the wires. 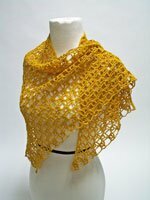 I let the shawl dry over night, and then, voila! I had lovely, airy, open lace! 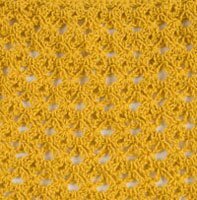 If you've caught the lace bug, check out Kristin Omdahl's Crochet Corner DVD for lots of great tips and techniques for all kinds of lace, from simple lace constructed with double crochets to intricate and beautiful hairpin lace. It's now available for digital download, so you can dive right in! I look forward to seeing your lace pieces in our gallery!